I went to Home Depot today and found some really neat succulents in 2.5 in-3.5 inch pots. I am excited to plant them in a mix container together. I am just trying to figure out what container to plant them in. I have an empty bonsai pot that I can plant it in... it is a bit small though and could hold just a couple. I was hoping to put them all in one container as a mini succulent garden. What I loved was unlike most house plants at HD they were labelled with their common and botanical name (and cultivar name if it had one) along with specific growing conditions. Well I will be back to post a picture to share. edited to say that the houseplants are usually the ones labelled "tropical foliage" keep moist bright light.... for every thing. With no name at all. The garden plants are usually good about labeling what they are at least. I would go with a shallow clay container with good drainage and don't use the heavy potting mixes. It should be pretty and easy care for you. Just don't overwater. 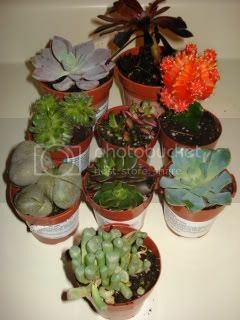 Some of the succulents and cacti available at our Home Depot and Lowe's has the label info and some doesn't. I think it depends on which growers the batch comes from. Congrats on your haul. They will make a pretty planter. I agree 100% with Jade. Potting mixes have a lot of plain old dirt and nothing to improve the drainage or to help the water move through the entire pot. If you can find a specific cactus mix, get that, but an orchid mix would work too. African violet mix is better than the regular potting mixes but it always feels, at least to me, like it's got a LOT of peat moss in it...and not a heck of a lot else. Thank you so much everyone for the advice! Yeah I went around town looking for a shallow terra cotta or even maybe an alternative shallow pot... but I didnt have any luck. Shallow pots are always important with succulents but especially because they are tiny little guys. As for the soil... I was thinking of using sand and fine coconut coir. The coconut coir is kinda like peat moss but in my opinion much better... it never gets compacts like peat and it super fast draining, and it holds water much better. So the combo of sand and the coir I think may be great combo for the mixed container. It is also light just like peat moss and it has no fertilizer in it, so I can put what I want into the pot to give it nutrients. What do you guys think? I get some of my best containers from the thrift stores around town. I would use the potting mix without the fertilizers in my opinion. Thanks for the suggestion Dale... I do find that I find really cool pots from yard sales and craigslist too. Or even better free planters on freecycle! hehe. Acacius try looking for a really large Terra cotta pot saucer at Home Depot, they make perfect cactus planters. You really don't need a drainage hole for cactus as you don't have to water to much and the terra cota will drain naturally as long as it is not glazed or painted. Great plants you found and they will look great planted all together. Vanessa those look wonderful. Can't wait to see what you do with them. Thank you so much Swindy and Bernie! Swindy thanks for the suggestion with the terra cotta pot saucer! I hadn't thought about that!